Calito is a multi best in show winner and recently added to his list of dog ccs and runner up in shows at speciality level by going Runner Up BIS at the Cocker Spaniel Society of NSW speciality. 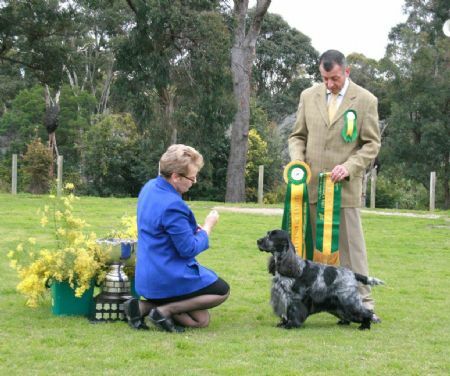 In 2010 Calito added to his very impressive start to the year by taking best in contest at the Tasmanian Contest of Champions. 2011 saw Calito add to his list of BIS wins, taking back to back wins on the one weekend. 2012 was a mixed year for Calito as he was out of the ring for a considerable part of the year, however he still finished 3rd in the dol pointscore and managed 4 BIGs, 4 RUBIGs and 1 BIS. 2012 Calito added Supreme Champion to his title. Calito has now retired from the showring, he enjoys his days at the Doulton Retirement Village.